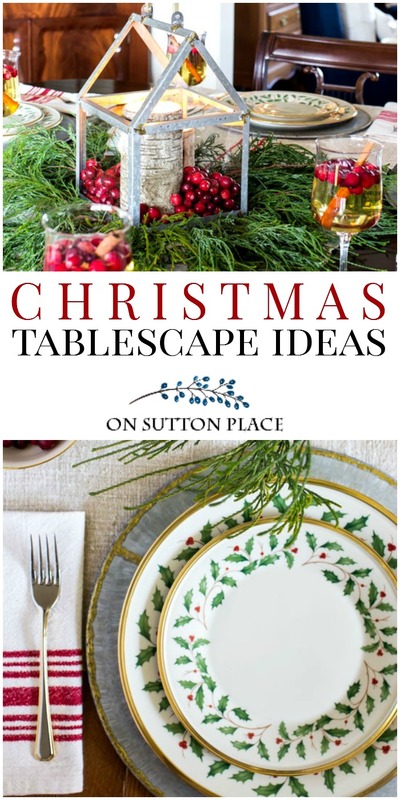 Christmas Tablescape Ideas | Rustic Meets Refined: How to combine elegant china and crystal with rustic Christmas farmhouse elements. 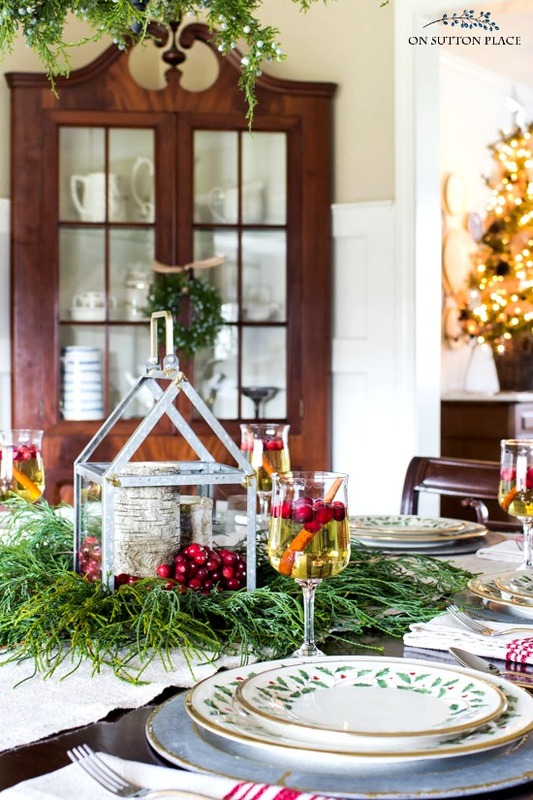 Welcome to the Christmas edition of Styled & Set, hosted by Lory from Designthusiasm…and Christmas tablescape ideas galore. If you are coming here from StoneGable, a very special welcome to you. I’ve known Yvonne for years and am one of her biggest fans. In fact, she’s a pretty hard act to follow! 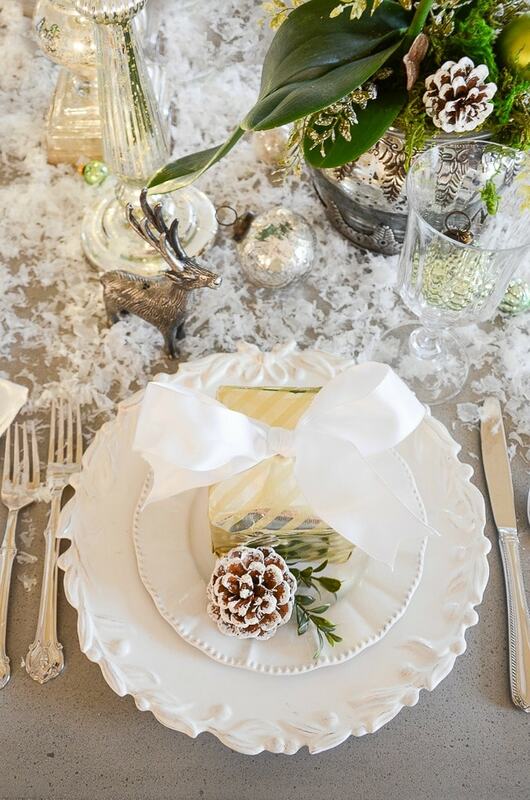 Today I’m featuring a tablescape that combines china and crystal with the rustic farmhouse elements I love. I will share a couple of tips along the way in case you would like to do the same. *This post contains affiliate links for your shopping convenience. Click HERE for my complete disclosure statement. 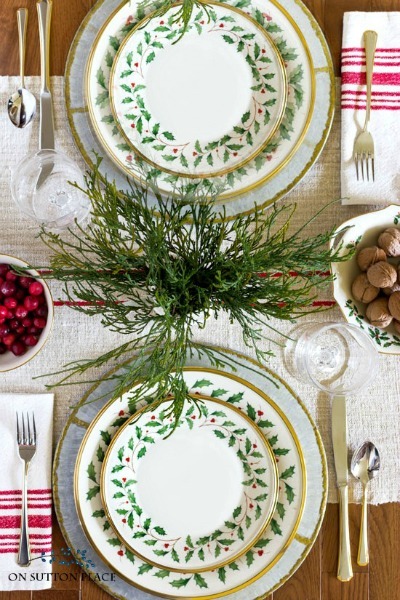 Like most of my Christmas tablescapes, this one began with my Lenox Holiday china. It was collected one place setting at a time over many years, and most of the place settings were Christmas gifts from my husband. The year I was finally able to use it was actually quite exciting! I mixed the china with rustic galvanized chargers from the Hearth & Hand line at Target. What makes this work is the gold trim on the chargers. I love the way it compliments the gold trim on the china. 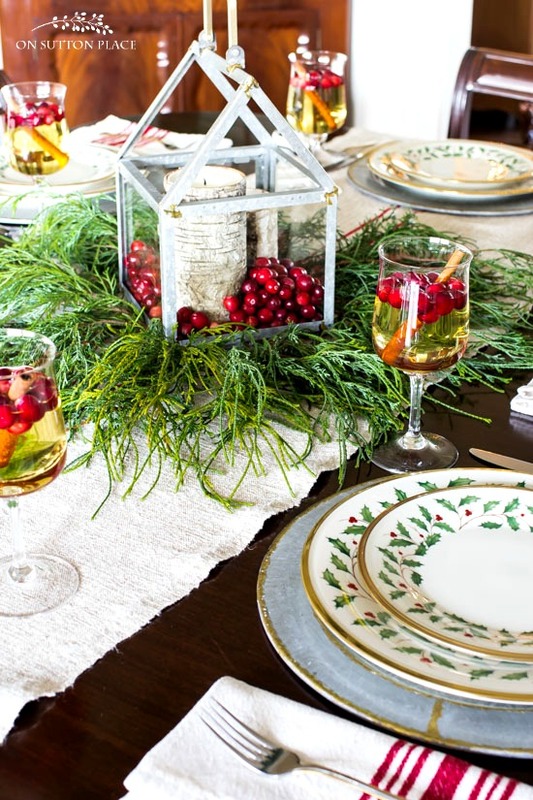 If you want to combine fine china with rustic accessories, make sure there is a common element. In this case, that element is color. The nice thing about these chargers is that they are both silver AND gold. If your china is trimmed in silver, they will still work! 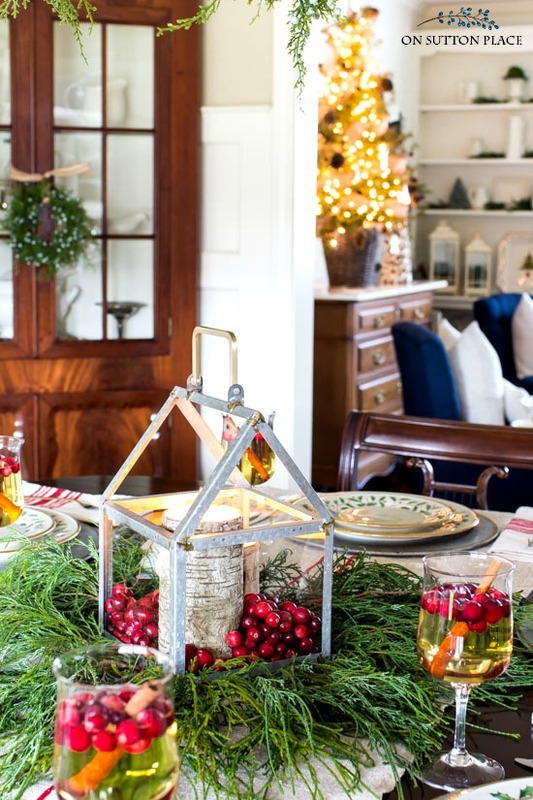 Most of the pieces of this tablescape are rustic with a farmhouse vibe. (My favorite!) The only refined elements are the china and crystal. To give the crystal a more casual look, I filled the goblets with apple cider. I added fresh cranberries and a cinnamon stick. Not only is this drink delicious, it’s festive and colorful as well. The centerpiece began with the galvanized lantern from Target. I bought one for the stairway and loved it so much I got a second one. Now I have a pair and I hope you like them because you’ll be seeing them again! I filled the lantern with birch candles and fresh cranberries. I trimmed a bit of greenery from one of my little bushes and it was just enough to surround the lantern. Grain Sack Table Runner: borrowed from my dad | Napkins: HomeGoods | Botanical prints: click HERE | Crystal goblets: Lenox (my wedding crystal) | Juniper garland: no longer available. New traditions are good…but so are the old ones. Every Christmas I get out the Holiday china and it brings back such good memories. When I set the table for my family, it’s a true labor of love and not work at all. 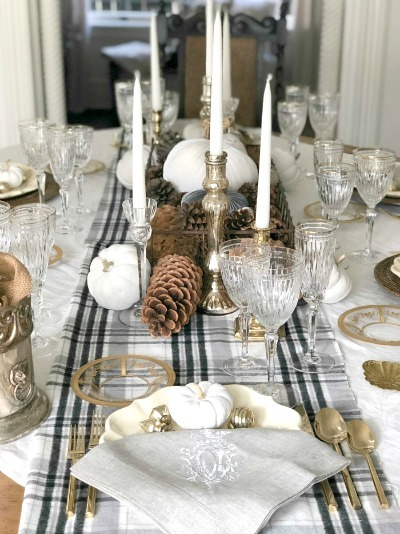 (I will admit that some of the Christmas prep totally feels like work…but not the table!) Make new traditions and try new things to keep your family holiday time fresh…but don’t let go of your old traditions. They are the stuff that families are made of. Now it’s time to send you along to my friend Kelly’s blog, My Soulful Home. Kelly is one of the nicest bloggers ever…and is an honest-to-goodness published author! Her book, A Year in Flowers, is beautiful and would make the perfect gift for the gardener in your life. After you visit Kelly, I hope you have time to visit a few more stops on the tour. All the links are included below. 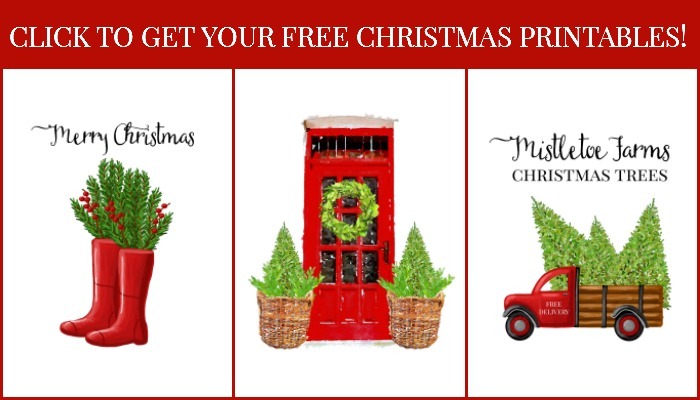 « Christmas: Porch & Bedroom Decor, Free Printables & More! I love the traditional colors in your table setting, Ann! The greenery is gorgeous and love those plates. I just love your style! Last year, your Christmas posts were what made me a ‘follower’. ;-) Thanks for sharing! Thank you Julie…Merry Christmas to you and your family! Your table is so pretty. 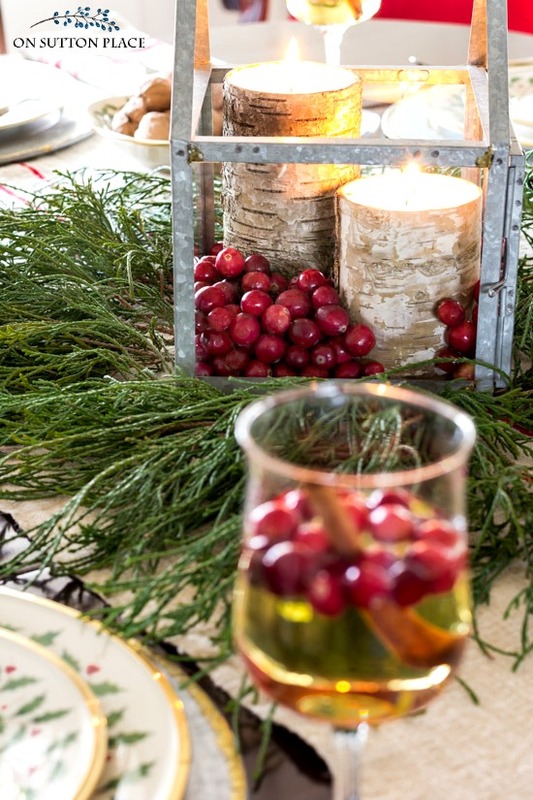 I love the centerpiece with the cedar. All the elements You used work so well together. I like the combination of rustic and refined! I feel like that fits my design style. The Lenox china is lovely! Hi Ann, Your table looks beautiful! I was wondering about the chandelier above your table. Did you paint it? I have an ugly brushed nickel chandelier that came with my house but I’m not sure I’m brave enough to paint it. Hi Jane…no I didn’t paint the chandelier. I got a new one when I had the dining room painted last spring. I wanted a simpler style and honestly the thought of painting my old one was overwhelming! Which size lantern did you buy? Mine was small and $19.99. Hi Sue…yes, it’s the small lantern for $19.99. I love the tablescape! I bought the lantern today at Target. How do I get the handle to stand up? I didn’t have any trouble with the handles. When I put them up, they just stayed there. Maybe your handle is just a bit looser? Oh, how do you do it?? Every time? 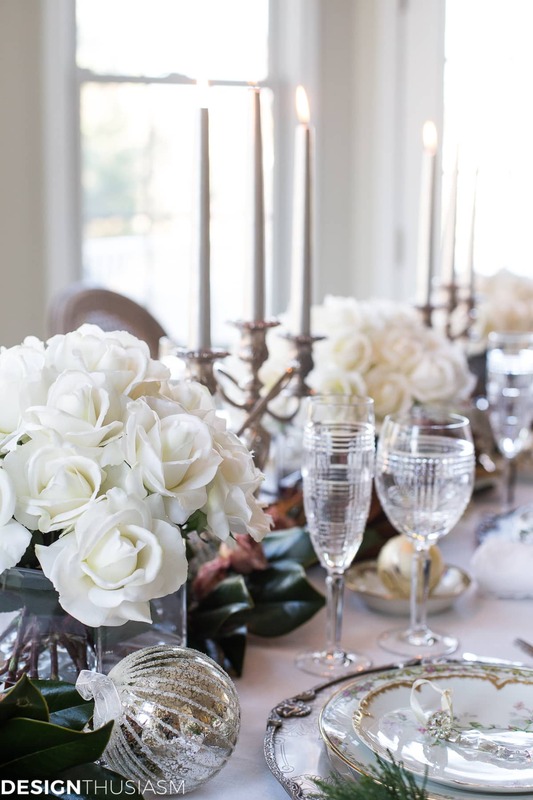 Every tablescape a beautiful, balanced, blend of dressy and casual, rustic and refined, everything-just-right! 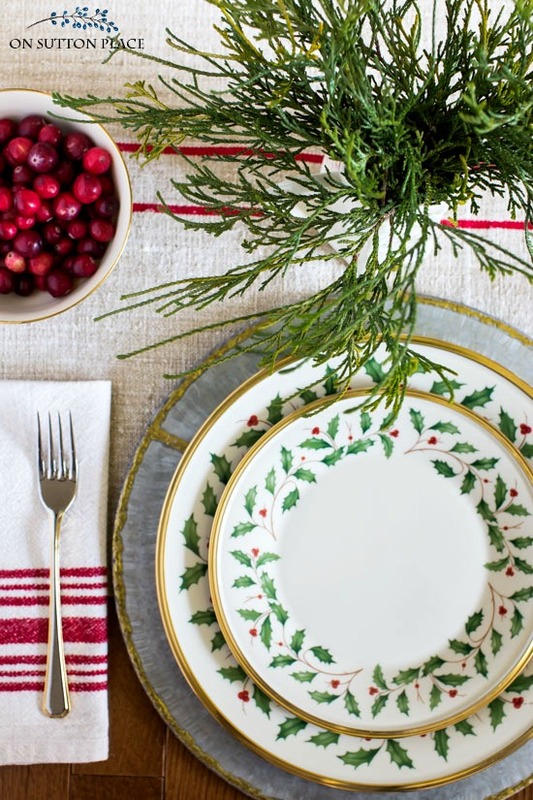 I especially love the classic Lenox Christmas dishes, ‘cause I have them too and it is so fun to see how you use them. Love the chargers—they balance the gold rims and silverware colors; will need to look into those. Thanks for the inspiration yet again :). Dear Anne. What a charming table you set. I have Christmas dishes I bought at CVS many years ago. Not as gentile as yours but suited my son when he was little. I make a special dinner on Christmas Eve so we can all be together and I use my mom’s China I was the only kid allowed to set,clear and hand wash since I was 11 and mom bought it from Higbees. My sister gave it to me when they cleaned out mom’s house. Then on Christmas Church, brunch and my cute dishes. My mom always says the grace and sticks in thanks moon for these dishes. Now I will have a different house but it will be mine and no slimy landlord can take it away. So new rooms and new things but traditions will remain. PS my sister cried when she saw the table set with moms dishes. I do things the way mom did. I do things the way my mom did too…Merry Christmas Jody! 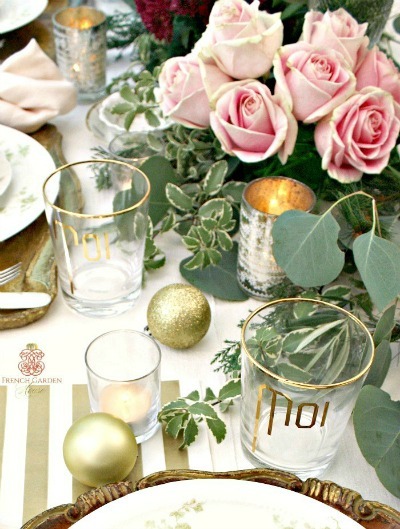 Beautiful table setting, I love the classic colors and not so much the silver and gold. I am definitely purchasing live spruce sprigs this year. has some really cute pieces that aren’t just for holidays but can be left out all year. I love your site! Everything is so beautiful and can easily be copied to fit into anyone’s home decor. Thank you for putting this site together and sharing. What a gorgeous/hospitable setting! Love how you’ve combined the formal and the rustic so seamlessly. 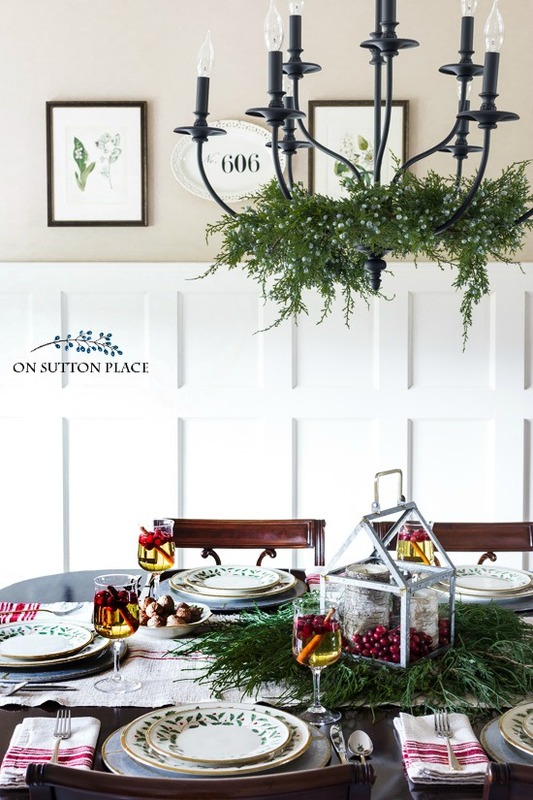 The juniper decorated chandelier is just icing on the cake. Wah, wha…so sorry that it’s no longer availble. (As a kid, we had junipers surrounding our patio, so it immediately took a piece of my heart!) Can imagine happy and memorable times at this setting…. May your Christmas be joyous!